Are you stuck in a writing rut? Try using a different medium. If you normally write on the computer, try pen and paper, or vice versa. Or maybe mix it up completely—use markers or crayons on construction paper. 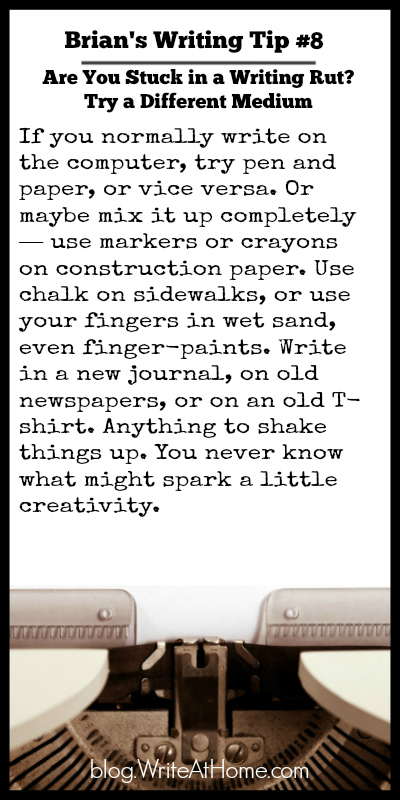 Use chalk on sidewalks, or use your fingers in wet sand, even finger-paints. Write in a new journal, on old newspapers, or on an old T-shirt. Anything to shake things up. You never know what might spark a little creativity.